Moscato, as it is now known, has its roots in Moscato d’Asti in Northwest Italy, where it was already cultivated and made since the 1870s. Made in the frizzante style, Moscato d’Asti was the wine that winemakers made for themselves. This low-alcohol wine could be enjoyed at midday meals and would not slow down the winemaker or his workers. After the work day was done, the Piedmontese tradition of long, multicourse evening meals gave Moscato d’Asti the purpose of a digestif, that cleansed and stimulated the palate for dessert. With the popularity finally spilling over to our shores, De Krans Wines in Calitzdorp made the first Moscato Perlé wine in South Africa in 2012 – the De Krans Premium Moscato Perlé. Regarded as one of South Africa’s leading port-style and sweet Muscadel producers, De Krans managed to evolve to producing a sophisticated Moscato. The wine puts a twist to traditional Muscadel, while showcasing the complex spicy and fruit flavours, finishing off with a fizz – completely transforming the idea of sweet into a refreshing, sparkly white wine with a hint of sugar. 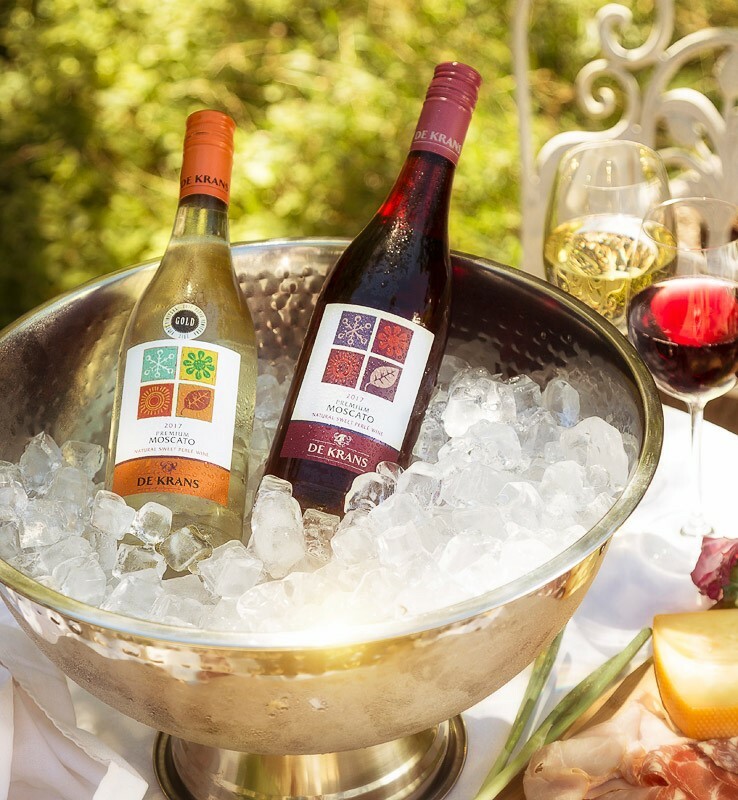 While the popularity of Moscato undeniably hails from the scenes of the rich and famous in the USA, the category has managed to nestle itself in all types of markets in South Africa. The good news about Moscato is that the price is quite competitive. The secret to Moscato’s success, is that it completely hits a home run in terms of both appeal, lower alcohol, functionality and price. Firstly, it appeals to most non-wine drinkers, who have proven likely to try something sweeter when it comes to experimenting with wine. The fruitiness combined with the sweetness and fizz makes the wine easily accessible to even the most unexplored taste buds. In return, the style also appeals to the most refined wine drinker or connoisseur, thanks to the fact that it is trendy, all round delicious and generally well-priced – making it a low risk buy, and even daring or exciting for the astute Sauvignon Blanc lover. Not only does the wine appeal to different markets in terms of wine experience, the wine also resonates with young and old. In addition, the wine is extremely appealing due to its generally low alcohol levels. The De Krans Premium White Moscato Perlé has an alcohol of 8.5%, making it an attractive choice, especially when it comes to health concerns and driving responsibilities. The lower alcohol, combined with the freshness and zest, gives it an overall feeling of drinking a “lighter” wine and displays fresh tropical fruit flavours of litchi and apricot enhanced by nuances of muscat on the nose, which carry through beautifully onto the palate. These flavours are further amplified with a fizzy taste and exotic spice. Moscato as a category has a far-reaching appeal in terms of its functionality. Moscato is often grouped with, or substituting a bubbly, it being lower in alcohol and a more affordable alternative. Moscato is also often utilized as a cocktail mixer. The website Yummly.com even allows you to engage in a tailor-made search for the perfect Moscato recipe, depending on your flavour/mix preference, etc. There is even a recipe for Strawberry Moscato Layer Cake – who knew? With the De Krans Premium White Moscato Perlé being such a hit, and with the De Krans team priding themselves on their passion for consistent change and innovation, it seemed only natural to develop something similar in style for the red wine drinkers out there. The newly released 2017 Premium Red Moscato Perlé is a natural sweet red perlé wine, made from predominantly Muscat de Frontignan grapes, blended with a small percentage of our own South African Pinotage grapes, to create the perfect balance in colour, flavour and taste. The result is a beautiful light ruby red colour, with fine bubbles and fresh fruit flavours of strawberries, blackcurrants and exotic spice. Both wines are great on their own or served with fresh Summer salads, charcuterie, light meals and even mild curries. Available from most outlets nationwide these wines retail for approximately R59 per bottle, respectively. For out of this world Moscato inspired recipes visit https://www.yummly.com, and for more information on these superb De Krans wines, visit www.dekrans.co.za.